UPDATED: Wed., Aug. 2, 2017, 2:09 p.m.
By the time her fifth child graduated from high school in 2015, Shaun Brown and her family knew the strategies for landing college scholarships. All her children growing up in Liberty Lake won a mix of local awards and tuition-based scholarships toward Brigham Young University. The eldest, now doing Stanford University graduate studies, recently won a three-year National Science Foundation Scholarship. She encourages opportunities for kids to present verbally to groups and to take on advanced subjects of interest, perhaps in science or math. Students should sign up early for college-required ACT and SAT tests, then take them again. “We had our kids take the ACT or SAT their sophomore year, just to see what it’s like, then they’d prepare to take them again their junior year,” Brown said. Spokane-area school advisers also encourage students and families to do some advance preparation ahead of 12th grade, because scholarship dollars are there – sometimes unclaimed – from national, state and local sources. Summer is a good time to record students’ past achievements, said Scott Kerwien, Spokane Public Schools director of college and career readiness. Kids and families can brainstorm about significant activities and awards to include on a student résumé, or at least start an informal list. 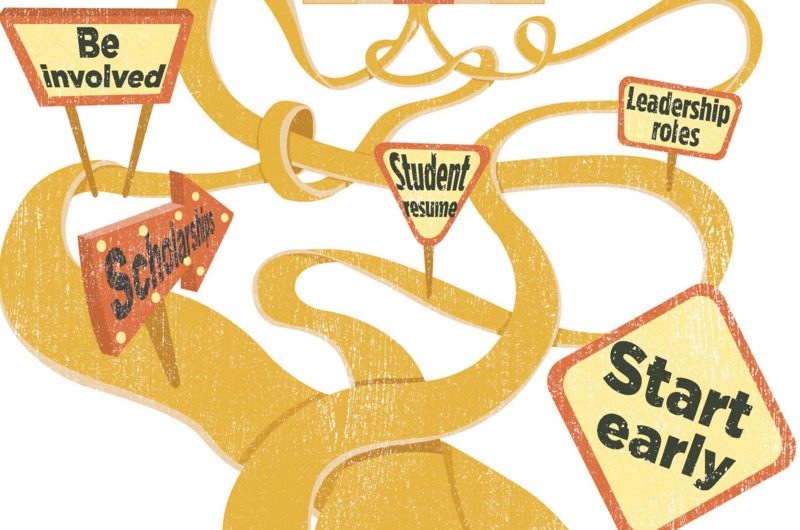 Before school starts, students also could outline strategies for junior and senior years, such as keeping track of scholarship application deadlines. A few applications are for juniors, Kerwien said, but some 90 percent become open for seniors. The records can mention leadership roles, clubs, service work, academic awards, and test scores. How to store activity records depends on the student. Some prefer iPhone notes. Others use a Microsoft Word document. He’s had students write about achievements using Google Docs. Kerwien has encouraged students to journal about what lessons were learned from a difficult situation. That can help when an application asks students to write a personal statement or short essay. Morgan Hatcher, a Gonzaga Preparatory School counselor, said generally the school encourages students during their junior year to spend more time building their written profiles, while researching colleges and scholarship options. “Putting in some of the leg work and searching for what they may qualify for during the junior year helps immensely,” Hatcher said. Students also should check the financial aid websites of the colleges where they are applying. They can find out if scholarships are granted automatically, or if additional applications are required. Kerwien said kids should consider activities early if schedules allow, although he noted freshman students usually are more focused on navigating transition from middle school. Parents or freshman students can ask school advisers or other leaders about a list of clubs and activities, Kerwien said. Scholarship committees often like to see volunteer service and leadership roles, such as seeing a community need and finding a solution, he added. Another way to show leadership is to serve as an officer in a club or community group. Key Club needs a student president, vice president and secretary, he said. Students might volunteer as a teacher assistant or join the National Honor Society. “That’s what a lot of scholarship committees are looking for: What sets you above your peers?” Kerwien said. For listing references on an application, Kerwien suggests seeking out a counselor, favorite teacher, or an activity adviser. If need be, sit down with that person to go over a “brag sheet” describing student accomplishments. Several scholarship information websites offer additional information, and Kerwien suggests that students create a separate Gmail account to field all college and scholarship correspondence. Each two-year program and college typically has a scholarship page. Kerwien said students are finding some success with a newer website, Raise.me. It gives micro scholarships, so a ninth-grade student can create a free account and build in listed achievements. A Google search under various categories for student interests, special needs, and background can find scholarship options. Students might find scholarships tied to a religion, family veteran status or heritage. Parents can ask friends or relatives if they have an open worksite scholarship program. Though senior year is crammed full, students can wedge in time for the hunt, if they treat scholarship and college preparations like a part-time job, Kerwien said. Published: July 30, 2017, 5 p.m. Updated: Aug. 2, 2017, 2:09 p.m.